Salesforce is one of the fastest-growing technologies in the world. As the number one CRM product on the market, businesses are utilizing Salesforce to overcome their sales, customer service, and marketing challenges. With this popularity, however, comes a huge demand for Salesforce professionals, as the drive for Salesforce implementation in businesses around the world is far greater than the talent pool can facilitate. As a Salesforce professional, it’s imperative you keep on top of the latest industry trends to inform which direction your career takes. It’s also important to know the working habits, salary, and employment benefits of your fellow professional, to ensure you’re enjoying the fruits of your labor and receiving all the perks you should be entitled to. Being a specialist Salesforce recruiter, Mason Frank knows a thing or two about Salesforce professionals, and its annual industry report is perhaps the tip of the iceberg. Compiled using a mixture of self-reported data from survey responses, and information derived from the thousands of job placements they’ve made in the last year, the report is the largest independent study of the Salesforce ecosystem and contains fascinating insight into how both businesses and end users are harnessing Salesforce technology. Here are some of the key findings from the Mason Frank Salary Survey. While Salesforce houses several comprehensive business tools, it is ultimately a sales-centric platform, and so it may come as no surprise to learn that Sales Cloud is still the most popular standalone Salesforce solution. Proficiency in Sales Cloud was reported by 82% of respondents to the survey, followed by Service Cloud (63%), Community Cloud (44%), and Marketing Cloud (31%). While fewer respondents reported proficiency in Marketing Cloud than any other standalone solution, this product was predicted to be the most in demand over the next 12 months. 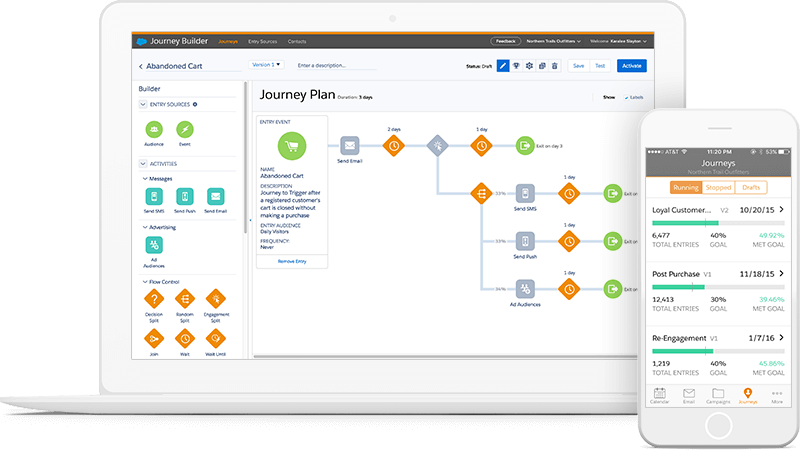 Clearly, Marketing Cloud impresses Salesforce users, so it’ll be interesting to see whether there’s a heavy uptake in the technology over the next year. Salesforce is a cloud-based platform and so the potential for remote working is great. Surprisingly, 89% of respondents to Mason Frank’s survey were under permanent employment, with 50% working in-house at a Salesforce customer (end user). Of those who reported working on a contract basis, 79% would consider becoming permanent for the right position, with benefits and financial compensation being the driving factor. When professionals currently working for a Salesforce customer were asked whether they would consider moving to a role with a partner in the next 12 months, 60% indicated they were interested, while just 21% would not be open to working for a partner. Mason Frank’s study found that 77% of respondents hold at least one certification, with the most popular being the Salesforce Certified Administrator credential. Getting certified is also a great way to increase earning potential, with 39% reporting an increase in salary after achieving certification. Employers are also receptive to subsidizing exam fees, with 75% of certified respondents reporting their employer contributed to the cost of certification. Salesforce is a relatively new technology, and its popularity has really only kicked in over the last five years. The majority of professionals working in the ecosystem are fairly fresh—37% reported having 0–3 years’ experience, and the same percentage had spent 4–6 years using the technology. Only 6% of respondents reported ten years of experience on the Salesforce platform; if you’re one of these professionals, your experience is extremely valuable, so make sure you know your worth and are maximizing your earning potential! 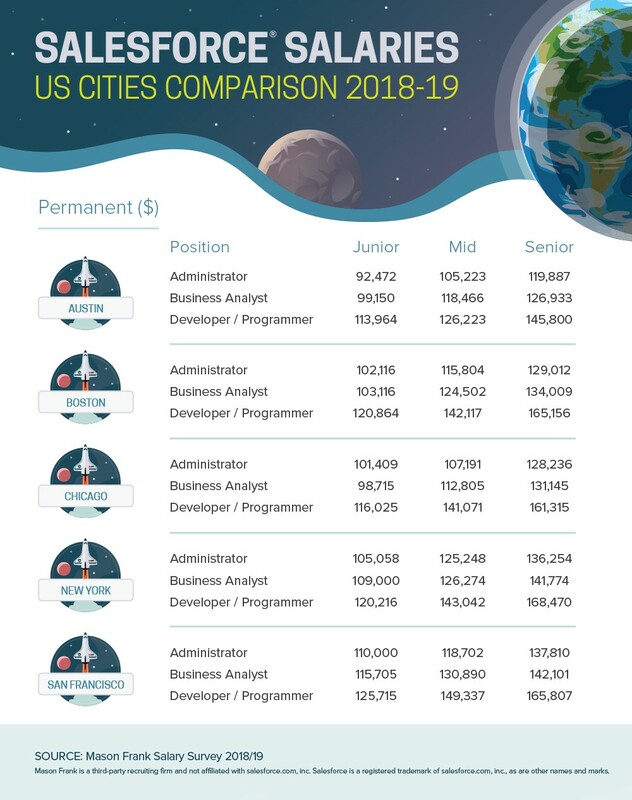 Cost of living, local economy, and demand for Salesforce professionals are huge factors in determining the average salary for a given Salesforce role in the US. Take a look at some of the salaries below for a snapshot of how they deviate between cities across all experience levels. Interested in learning more? 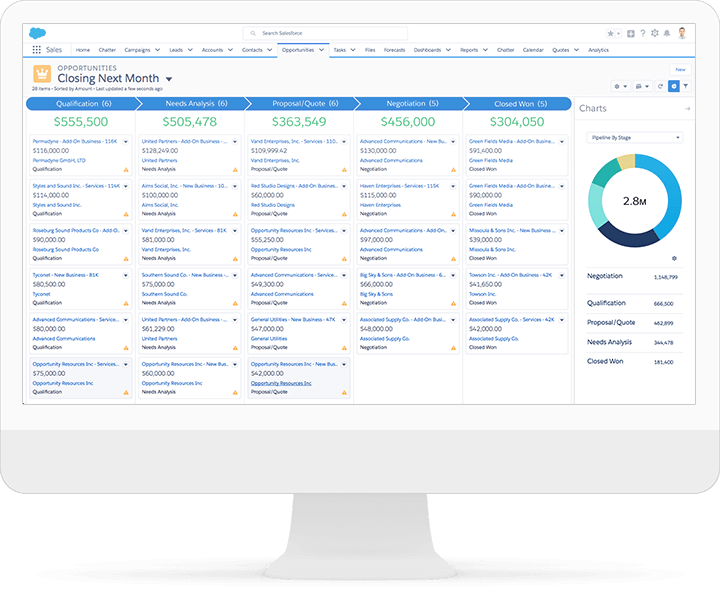 Download Mason Frank’s 2018/19 Salesforce salary survey in full for a detailed exploration of salaries, benefits, and working habits of Salesforce professionals.